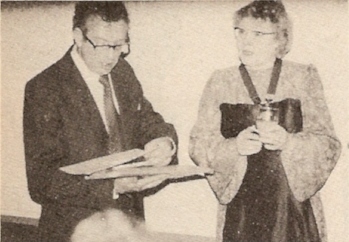 Mr. D. Jackson (General Secretary) and Mrs. G. Davis (Master) discuss last minute alterations. The Winchester and Portsmouth Diocesan Guild held their 17th Annual Dinner at The Bere Hill House Hotel, Andover on Saturday 20th April. The dinner was attended by approximately 100 members, guests and friends, including a past Master, Mr. Roger Savory, whom we were glad to see. All the tables were named after Surprise methods; Pudsey and Yorkshire to name only two. The Bishop of Southampton, the Right Rev. David Cartwright, who was to have given the speech, was unable to attend, and his place was filled by the Master of the Guild, Mrs. Gilian Davis. Mr. Geoff Dodd, one of our Guild's most distinguished ringers, having rung 1000 peals, gave a very humorous response and told us of his early bellringing experiences which began during the War (which War, we do not know!) and mentions the late George Williams who was still ringing into his early 90s. 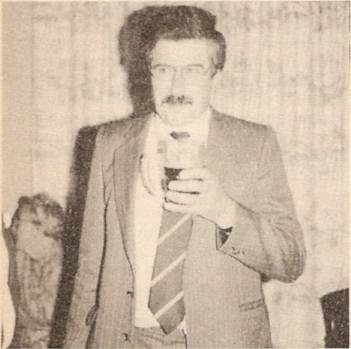 Mr. Dodd proposed a toast on behalf of the Guild. Mr. Lyndon Hatfield, Chairman of the Portsmouth District, and member of the Education Committee gave a short speech and proposed a toast to the visitors. Mr. Brian Oaks (Andover's Ringing Master) at the Dinner. Mrs. Judith Robertson, from the neighbouring Salisbury Guild, replied to Mr. Hatfield's speech giving her own interesting account of the towers she has rung at in our Guild. This seemed to be more than I myself have rung at! The closing speech was made by Mrs. Gilian Davis, commenting on the success of the dinner, and hoping that the next would be as well represented. On behalf of the Guild, I would like to thank the social committee for a very enjoyable evening.